No Minimums Since 1998. Online stockist of plastic sheet products. Custom Plexiglass Fabrication. Stock Sizes. Need custom cut down acrylic? Try our Instant Cut To Down Size Calculator! Please read the instructions below on how make a custom cut down order for 1/16'' clear acrylic sheets. Custom sizes must be smaller than the selected stock size. Stock Sizes. Need custom cut acrylic? Try our Instant Cut To Down Size Calculator. Please read instructions below on how to place a custom cut down to size order for 1/8'' clear acrylic sheets. Custom sizes must be smaller than the selected stock size. Stock Sizes. Need custom cut acrylic? Try our Instant Cut To Down Size Calculator. Please read instructions below on how to place a custom cut down order for 3/16'' clear acrylic sheets. Custom sizes must be smaller than the selected stock size. Stock Sizes. Need custom cut acrylic? Try our Instant Cut To Down Size Calculator. Please read the instructions below on how make a custom cut down order for 1/4'' clear acrylic sheets. Custom sizes must be smaller than the selected stock size. Stock Sizes. Need custom cut acrylic? Try our Instant Cut To Down Size Calculator. Please read the instructions below on how make a custom cut down order for 1/8'' clear acrylic sheets. Custom sizes must be smaller than the selected stock size. Stock Sizes. Need custom cut acrylic? Try our Instant Cut To Down Size Calculator. Please read the instructions below on how make a custom cut down order for 1/2'' clear acrylic sheets. Custom sizes must be smaller than the selected stock size. Stock Sizes. Need custom cut acrylic? Try our Instant Cut To Down Size Calculator. Please read the instructions below on how make a custom cut down order for 3/4'' clear acrylic sheets. Custom sizes must be smaller than the selected stock size. Stock Sizes. Need custom cut acrylic? Try our Instant Cut To Down Size Calculator. Please read the instructions below on how make a custom cut down order for 1'' clear acrylic sheets. Custom sizes must be smaller than the selected stock size. Stock Sizes. Need custom cut lexan polycarbonate sheet? Try our Instant Cut To Down Size Calculator. Please read the instructions below on how make a custom cut down order for 1/8'' thick lexan sheets. Custom sizes must be smaller than the selected stock size. Stock Sizes. Need custom cut lexan polycarbonate sheet? Try our Instant Cut To Down Size Calculator. Please read the instructions below on how make a custom cut down order for 3/16'' thick clear lexan sheets. Custom sizes must be smaller than the selected stock size. Stock Sizes. Need custom cut lexan polycarbonate sheet? Try our Instant Cut To Down Size Calculator. Please read the instructions below on how make a custom cut down order for 1/4'' thick clear lexan sheets. Custom sizes must be smaller than the selected stock size. Stock Sizes. Need custom cut lexan polycarbonate sheet? Try our Instant Cut To Down Size Calculator. Please read the instructions below on how make a custom cut down order for 3/8'' thick clear lexan sheets. Custom sizes must be smaller than the selected stock size. Stock Sizes. Need custom cut lexan polycarbonate sheet? Try our Instant Cut To Down Size Calculator. Please read the instructions below on how make a custom cut down order for 1/2'' thick clear lexan sheets. Custom sizes must be smaller than the selected stock size. Stock Sizes. Need custom cut transparent lexan polycarbonate smoked gray sheet? Try our Instant Cut To Down Size Calculator.Please read the instructions below on how make a custom cut down order for 1/4'' thick lexan sheets. Custom sizes must be smaller than the selected stock size. Stock Sizes. Need custom cut white acrylic sheet (#3015)? Try our Instant Cut To Down Size Calculator. Please read the instructions below on how make a custom cut down order for 1/8'' thick white plexiglass sheets. Custom sizes must be smaller than the selected stock sizes. Stock Sizes. Need custom cut white acrylic sheet (#3015)? Try our Instant Cut To Down Size Calculator. Please read the instructions below on how make a custom cut down order for 3/16'' thick white plexiglass sheets. Custom sizes must be smaller than the selected stock size. Stock Sizes. Need custom cut white acrylic sheet (#3015) ? Try our Instant Cut To Down Size Calculator. Please read the instructions below on how make a custom cut down order for 1/4'' thick white plexiglass sheets. Custom sizes must be smaller than the selected stock size. Stock Sizes. Need custom cut Black acrylic sheet (#2025)? Try our Instant Cut To Down Size Calculator. Please read the instructions below on how make a custom cut down order for 1/8'' thick black acrylic sheets. Custom sizes must be smaller than the selected stock size. Stock Sizes. Need custom cut black acrylic sheet ( # 2025 )? Try our Instant Cut To Down Size Calculator. Please read the instructions below on how make a custom cut down order for 3/16'' thick black acrylic sheets. Custom sizes must be smaller than the selected stock size. Stock Sizes. Need custom cut Black acrylic sheet (#2025)? Try our Instant Cut To Down Size Calculator. Please read the instructions below on how make a custom cut down order for 1/4'' thick black acrylic sheets. Custom sizes must be smaller than the selected stock size. Yellow Plexiglass (Acrylic) #2037 - Yellow Acrylic sheet offers superb optical clarity and optimum performance that cannot be matched at any price. Please read the instructions below on how make a custom cut down order for 1/8'' thick yellow acrylic sheets. Custom sizes must be smaller than the selected stock size. Yellow Plexiglass (Acrylic) #2037 - Yellow Acrylic sheet offers superb optical clarity and optimum performance that cannot be matched at any price. Please read the instructions below on how make a custom cut down order for 3/16'' thick yellow acrylic sheets. Custom sizes must be smaller than the selected stock size. 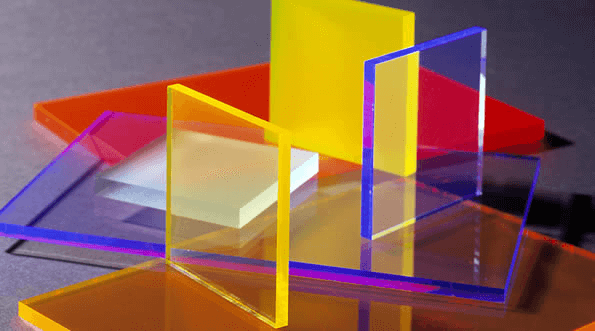 Yellow Plexiglass (Acrylic) #2037 - Yellow Acrylic sheet offers superb optical clarity and optimum performance that cannot be matched at any price. Please read the instructions below on how make a custom cut down order for 1/4'' thick yellow acrylic sheets. Custom sizes must be smaller than the selected stock size. Blue Plexiglass Acrylic #2050 is a multi-purposed material that is both sturdy and light weight. Plexiglass is used ideally for displays, aquariums, and more! This material can be drilled, routed, laser cut, sawed, silk-screened, and formed. Please read the instructions below on how make a custom cut down order for 3/16'' thick blue plexiglass sheets. Custom sizes must be smaller than the selected stock size. Stock Sizes. Need custom cut acrylic mirror? Try our Instant Cut To Down Size Calculator. Please read the instructions below on how make a custom cut down order for 1/8'' thick plexiglass acrylic mirror sheets. Custom sizes must be smaller than the selected stock size. Stock Sizes. Need custom cut acrylic mirror? Try our Instant Cut To Down Size Calculator. Please read the instructions below on how make a custom cut down order for 1/4'' thick plexiglass acrylic mirror sheets. Custom sizes must be smaller than the selected stock size. Stock Sizes. Need custom cut Fluorescent Red Acrylic Sheet? Please read the instructions below on how make a custom cut down order for 1/8'' thick fluorescent sheets. Custom sizes must be smaller than the selected stock size. Actual Color in photo is representative, but may vary due to photography, monitor, and lighting conditions. Stock Sizes. Need custom cut Fluorescent Red Acrylic Sheet? Please read the instructions below on how make a custom cut down order for 1/4'' thick fluorescent sheets.Custom sizes must be smaller than the selected stock size. Actual Color in photo is representative, but may vary due to photography, monitor, and lighting conditions. Stock Sizes. Need custom cut Fluorescent Green Acrylic Sheets? Please read the instructions below on how make a custom cut down order for 1/8'' thick fluorescent sheets. Custom sizes must be smaller than the selected stock size. Actual Color in photo is representative, but may vary due to photography, monitor, and lighting conditions. Stock Sizes. Need custom cut Fluorescent Green Acrylic Sheet? Please read the instructions below on how make a custom cut down order for 1/4'' thick fluorescent sheets. Custom sizes must be smaller than the selected stock size. Actual Color in photo is representative, but may vary due to photography, monitor, and lighting conditions. Stock Sizes. Need custom cut Frosted Acrylic Sheet? Please read the instructions below on how make a custom cut down order for 1/8'' thick frosted plexiglass sheet. Custom sizes must be smaller than the selected stock size. Actual Color in photo is representative, but may vary due to photography, monitor, and lighting conditions. Stock Sizes. Need custom cut Frosted Acrylic Sheet? Please read the instructions below on how make a custom cut down order for 3/16'' thick frosted plexiglass sheet. Custom sizes must be smaller than the selected stock size. Actual Color in photo is representative, but may vary due to photography, monitor, and lighting conditions. Stock Sizes. Need custom cut Frosted Acrylic Sheet? Please read the instructions below on how make a custom cut down order for 1/4'' thick frosted plexiglass sheets. Custom sizes must be smaller than the selected stock size. Actual Color in photo is representative, but may vary due to photography, monitor, and lighting conditions. Stock Sizes. Need custom cut P99 Non Glare Acrylic Sheet? Please read the instructions below on how make a custom cut down order for 1/8'' Non-Glare acrylic sheet. Custom sizes must be smaller than the selected stock size. The VIP PLASTICS is a five-star rated plastic supplier, offering you everything from acrylic sheets to polycarbonate, PVC and even nylon. Buy online today! VIP Plastics gives you the option to select any material color and thickness. Be sure to provide correct information. Oversized dimensions are automatically declined. Fill out a quote and within 1-3 hours you'll receive a quote and production time after approving your order. We can make these products and many more within 2-5 days normal time depending on the quantities. We can also overnight and make rush order, but there will be a charge. We have the specialty in Laser & CNC cutting on any acrylic/plastics shapes, forms. Please upload any drawing and submit to us and we will provide with a quote. Your one stop acrylic center for any shape and or product. VIP Plastics has a proud heritage of customer service and reliability since 1998. Our top priority is to empower the people we touch every day - our employees and our customers. By living our Core Ideology and always actively listening; we continue to cultivate an energetic, rewarding and passionate atmosphere that fulfills our staff and keeps us producing products that people truly need.VIP Plastics is dedicated to serving you. Your order will be treated individually, in a professional manner. We are only interested in serving you with the right acrylic for the right application, providing quality products from inventory at competitive prices. All of our products are designed to provide the most effective, easy-to-use display and merchandising solutions for businesses at any stage in their life cycle. It’s our mission to help you connect with the world and build your brand with products that are personalized to your needs. Our philosophy is simple. Combine,quality materials, cutting-edge manufacturing technology and the desire to gain the trust of our customers while offering extremely competitive pricing. Welcome to VIP Plastics, best source for Acrylic, Polycarbonate, PVC and many more types of sheets. We have standard sizes in stock thickness ranges from 1/8" to 2" (clear & color) or you can also use our Instant Calculator to fit your specifications. Also we have cast and extruded acrylic which we can supply wide range of sheets. Acrylic can be cut in several methods. CNC & Laser cutting and polishing edges is also available. Acrylic Bakery Case.This three drawer display case will show off your donuts, bagels, pastries, and more in a organized and stylish way. It features 3 bins that pull out as drawers for easy accessibility and easy refilling and serving. Stock Lexan Polycarbonate Sheets 4"x8"